Outdoor fitness, healthier lifestyles and happiness is for everyone! Designed for maximum accessibility and longevity, the all-steel, powder-coated Universal Access Lat Pull-Down Station promotes inclusion, fitness and obtaining a healthier lifestyle in a natural open environment. The dual sided, Universal Access Lat Pull-Down Station provides two options tailoring to individuals with physically specific needs. One side of this outdoor fitness station is developed to be able to fit and in back a wheelchair, allowing the user to remain seated and reach up, gripping the ergonomic handles to perform the upper body exercise. The second side features a strategically designed, contoured ergonomic seat and grips. Developed to be innovative, low impact and user friendly, isokinetic spring resistance is combined with the force expended by the user to provide an easy to use, customized experience. 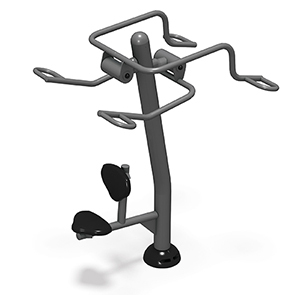 Since this Lat Pull-Down outdoor fitness station only uses body and spring resistance, users are able to focus on the muscles, form and techniques of the exercises to shape, tone and strengthen the upper body while also able to improve pull-up abilities. Performing lateral pulldowns on either side of the Universal Access Station will challenge each skill level and provide the ability to transform the upper body for the future. This Universal Access Lat Pull-Down Station is an easy to use fitness machine to strengthen the upper body, build muscular endurance and improve flexibility and agility. Broadens shoulders to improve posture.